: Always make sure your child is secured properly in a device that is appropriate for their height, age and weight. Child safety restraints must be bought separately from your vehicle. Failure to follow these instructions and guidelines may result in an increased risk of serious injury or death to your child. : All children are shaped differently. 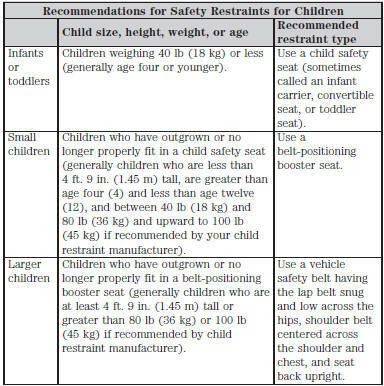 The recommendations for safety restraints are based on probable child height, age and weight thresholds from NHTSA and other safety organizations, or are the minimum requirements of law. Ford recommends checking with a NHTSA Certified Child Passenger Safety Technician (CPST) and consulting your pediatrician to make sure your child seat is appropriate for your child, and is compatible with and properly installed in your vehicle. To locate a child seat fitting station and CPST, contact the NHTSA toll free at 1-888-327-4236 or on the internet at http://www.nhtsa.dot.gov. In Canada, check with your local St. John Ambulance office for referral to a CPST or for further information, contact your provincial ministry of transportation, or locate your local St. John Ambulance office by searching for St. John Ambulance on the internet, or Transport Canada at 1–800–333–0371 (http://www.tc.gc.ca). Failure to properly restrain children in safety seats made especially for their height, age, and weight may result in an increased risk of serious injury or death to your child. • You are required by law to properly use safety seats for infants and toddlers in the United States and Canada. • Many states and provinces require that small children use approved booster seats until they reach age eight, a height of 4 feet 9 inches (1.45 meters) tall, or 80 pounds (36 kilograms). Check your local and state or provincial laws for specific requirements about the safety of children in your vehicle. • When possible, always properly restrain children twelve (12) years of age and under in a rear seating position of your vehicle. Accident statistics suggest that children are safer when properly restrained in the rear seating positions than in a front seating position. See Front Passenger Sensing System in the Supplementary Restraints System chapter for more information.